By Mary Beth Foster This story and its images were originally published in The Mint Hill Times on May 23, 2018. 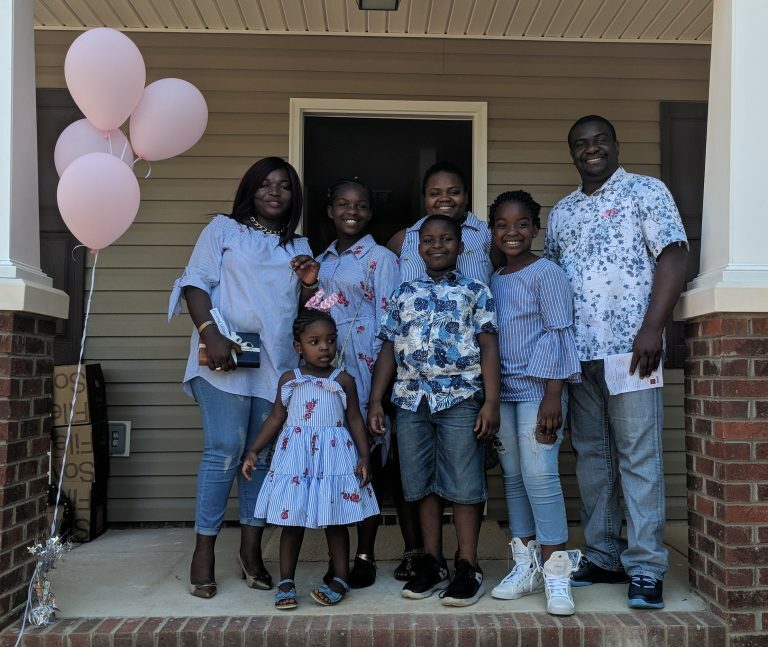 On Saturday, May 12, 2018, Greater Matthews Habitat for Humanity celebrated the completion of the Wenyi family’s brand new home. “Today, we come here to celebrate the hard work and dedication of a deserving family who is realizing the dream of home ownership,” said Greater Matthews Habitat for Humanity Executive Director Natisha Rivera-Patrick. “Home dedications are celebrations of talent and work, determination, volunteerism, family, faith and community. They are also a great reminder of living in the present and rejoicing in new beginnings. The Wenyi family’s new beginning started in 2010 when Jean-Jacques and his wife Lucie fled the war-torn Democratic Republic of the Congo in search of freedom and a better future for their family of seven. The pair exhausted their savings securing official paperwork and transportation to the United States. Geologist Jean-Jacques and nurse Lucie arrived without job prospects and speaking little English. For a time, Jean-Jacques returned to the Congo to work while Lucie remained in the United States with their five children. Liz Sweeney, Habitat Homeowner Services Coordinator, hands the keys to the Wenyi family. The Wenyi family has been working – literally – to build their home with Greater Matthews Habitat for Humanity for over three years now. Future homeowners like the Wenyis work hand-in-hand with Habitat volunteers on the construction of their own homes and the homes of others. After a rigorous vetting process, families selected to receive a home promise to invest 400 hours of “sweat equity” in the building of theirs and others’ homes in lieu of providing a down payment. A “sweat equity” down payment is one of the key components that helps make home ownership possible for families like the Wenyis. Another important component for families ineligible for conventional financing is the 0% interest 25-year mortgage, [in this instance] provided by the State Employees Credit Union. 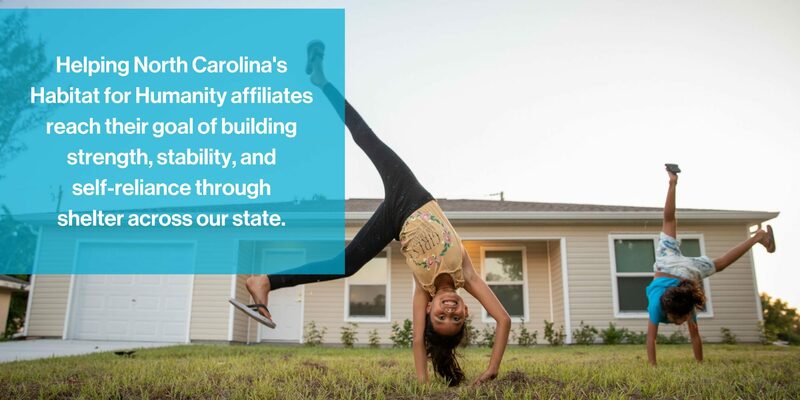 In 2015 SECU Foundation committed 10 million dollars to expanding affordable housing in North Carolina [by] partnering with Habitat for Humanity. Today, they have helped put renovated, remodeled and new Habitat homes in almost all 100 North Carolina counties. “We’re committed to supporting Habitat’s mission and the belief in what can be accomplished when people come together to build a home for someone who is willing to give their time for others before embarking on their own Habitat home,” said SECU Advisory Board Member Katherine Neal. This marks the second annual Sandy Marano Memorial Build. In 2016, Greater Matthews Habitat for Humanity lost its Family Services Coordinator to breast cancer. The Wenyi family began their journey with Sandy, and their home is the second Habitat home built in her memory. In recognition of the strength and resilience Sandy showed both throughout her life and in her battle with breast cancer, the Wenyi home was a Women’s Build, a national initiative through which women across the country partner with their local Habitat chapters to recruit women both to build and to advocate for simple, decent, affordable houses in their communities. Sandy herself inspired many in the community, and her family and friends were a crucial part of the volunteer effort that built the Wenyi home. The Wenyi Family, pictured on their new front porch.